Trying to repair my Dolphin for one year. Problem is the same as for most of the users: It stops working within the first minute. The electronic board is REV06 with a COP micro controller, soft 6H. See attached picture. 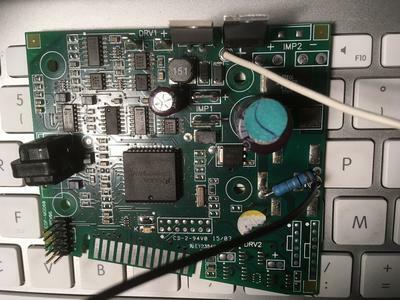 I'am currently active in a reverse engineering process, with the aim to locate where the current measurement is done (as we know it, the micro controller decides to stop the cleaning process as soon as one of the two motors consumes too much or not enough current). The LM224 chips is used, I think, as comparator to check if the current value is nominal or not. Un fortunately the PCB is multilayer and I did not succeed in tracking the edges up to the micro controller.